Reading older newspaper etiquette columns isn’t just an interesting look at life in an earlier time. It also helps us to better understand everything from naming conventions to why our ancestors acted in a specific manner. One thing I’m interested in learning: in what ways did etiquette influence how our female ancestors were listed in records and documents? This 1973 newspaper column is a good example. The first question has to do with the wording of a death notice. The writer is confused why the first wife of the deceased is mentioned since she had died three decades prior and the couple had no children. The etiquette writer, Louise David, answers that she also finds that mention of the previous wife unusual. As a genealogist, I would want that information to provide me with clues to my family member’s life. But this answer serves as a good reminder that we don’t know who wrote an ancestor’s obituary, and so we cannot be certain how complete it is due to their own preferences or even the “etiquette” of the time. The second letter writer in this column asks about using the term “Jr.” after his name, and the response is: because his name is not exactly the same as the father (the middle names are different) that he cannot use the term “Jr.” after his name. 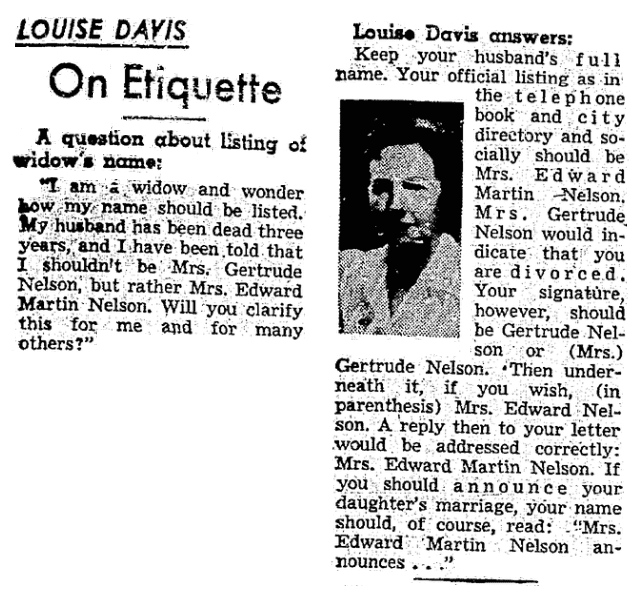 This 1955 etiquette column is one family historians should take note of, especially if you are looking for a widowed grandmother in a city directory. 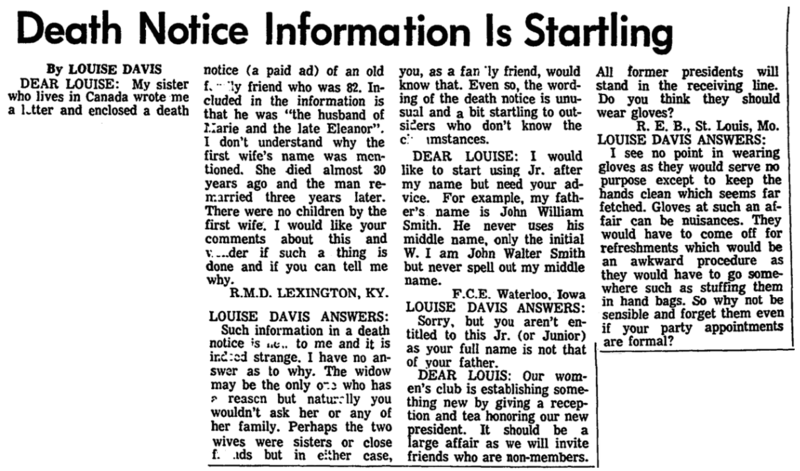 The writer asks about how she should be referred to since her husband has been dead three years – whether Mrs. Gertrude Nelson or Mrs. Edward Martin Nelson is correct. The answer given: she needs to keep her husband’s full name in telephone books and city directories because using her first name as in the “Mrs. Gertrude Nelson” example would indicate she is divorced. 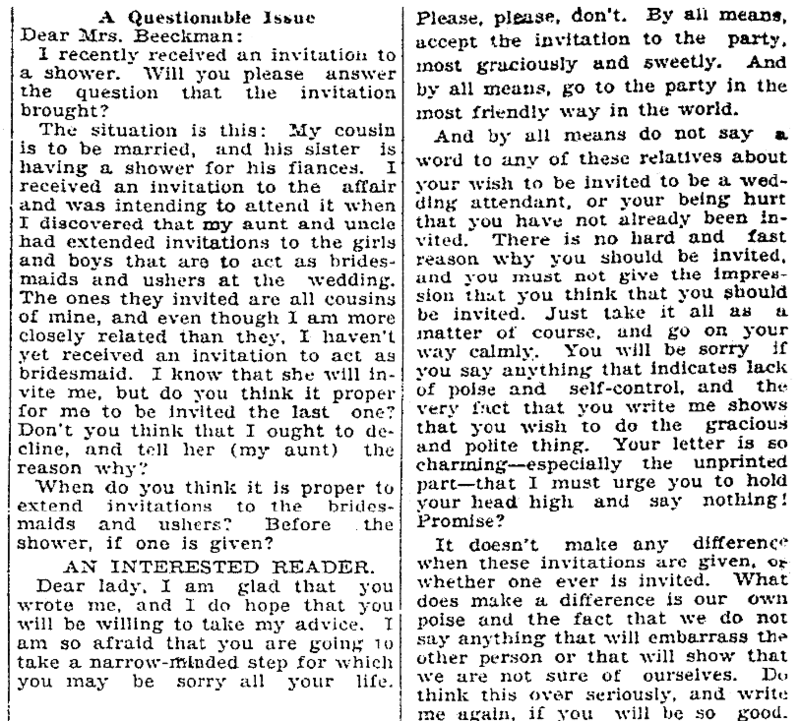 Reading the etiquette columns, it becomes obvious that one of the biggest sources of questions needing answers revolve around weddings. It makes sense; these are occasions that don’t happen every day in a family and so there is bound to be uncertainty about how to handle these events. In this 1941 newspaper article the question of the financial obligations of the bride and the groom’s family is addressed. 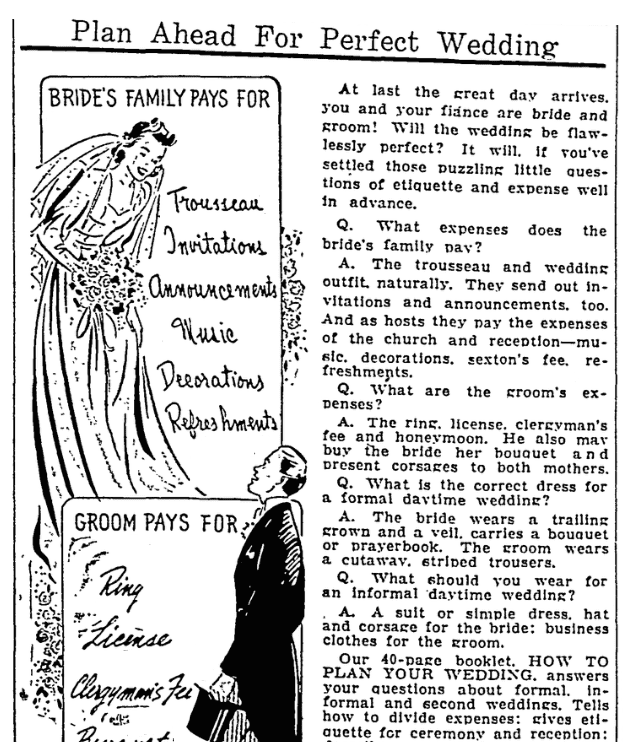 While the assumption is the bride’s family pays for the wedding, the groom in 1941 is counseled to pay for the wedding ring, marriage license, clergymen’s fee, the honeymoon and the bride’s bouquet, as well as the corsages for the couple’s mothers. She goes on to instruct the writer to attend and not let her feelings show. She asks the writer to promise her that she will “hold you head high and say nothing!” She then invites her to write back and let her know how it went. It is letters like these that make me wish for a follow-up! In some cases, you may hope that an etiquette rule has changed. This 1949 wedding rule makes you hope for a tardy mother of the bride. According to this etiquette column, titled “Social Security,” once the mother of the bride has been seated, no one else may be seated. As time goes by questions that involve new technology or our changing lifestyles influence the etiquette of the day. While some rules may be appropriate generation after generation, life’s evolution requires a constant updating of appropriate manners. Today you can purchase the 19th edition of Emily Post’s Etiquette which addresses manners when communicating, in public, and at weddings. Did your family quote Emily Post or read Miss Manners? Are there any family “habits” you have that are due to the etiquette dictates of an earlier generation? Have you used etiquette books or columns to learn more about how our families lived in a different generation? 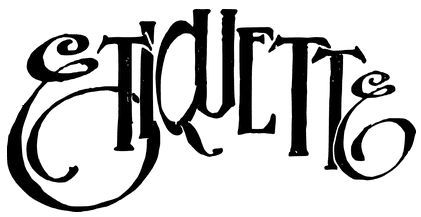 * “Etiquette Columns,” Encyclopedia.com (https://www.encyclopedia.com/media/encyclopedias-almanacs-transcripts-and-maps/etiquette-columns: accessed 29 December 2018).